Over the past few years of running my own blogs, building up email lists and a variety of audiences, I have tried just about every single different email marketing service provider. Each provider offers their own unique features and benefits so it is never easy to carry out a perfect side by side comparison for each. Also every blog I have built has had slightly different requirements and has meant that I’ve had to ditch my preferred provider for another. In this article I hope to offer up some insights from my past 10 years of blogging and give you a fair assessment of the major email providers. * Pricing is based on 5,000 subscribers. Get Response is a reliable email marketing platform with a large number of features that make it easy for new users to get started. It is easy to use, has many built-in features and offers a 30-day free trial. This makes it a good entry-level platform for businesses that want an easy and reliable solution to their email marketing needs. Get Response has several pricing tiers depending on how many clients one needs to contact. For 1,000 subscribers, it costs $15 per month. The most popular option supports 5000 subscribers and costs $49 per month. As the amount of subscribers rises, so does the price. Although if you pay for 12 months or 24 months, the price drops significantly. Below is the pay monthly prices. Below are the prices if you sign up for a year. It is possible to receive an 18 percent discount by signing up for a year at a time, but should you cancel the service the fee is non-refundable. The low price of Get Response makes it an excellent solution for businesses seeking low-cost marketing solutions, especially considering the amount of features Get Response offers. If you pay for two years, you can get a 30% discount on the original monthly price. Get Response has a feature set designed to make email marketing easy and not very time-consuming. It comes with a visual email creator that makes it very easy to create high-quality good-looking emails. To make it even easier, Get Respon comes pre-loaded with several hundred pre-designed email templates and access to the iStock stock photo library, allowing even the less artistically-inclined to create professional email campaigns quickly and easily. In addition to the time- and energy-saving features, Get Response also has a number of features designed to maximize the effectiveness of your marketing campaigns. Importing contacts is very easy and quick, allowing you to transfer data from your customer resource management system or from your previous email marketing manager. Get Response also allows you to see how your emails look on different browsers and operating systems, as well as send multiple versions of the same email to test which is more effective at generating views and clicks. Get Response also offers very robust segmentation and automation tools. This means that you can tailor your content specifically to various subgroups within your mail campaign. You can sort customers by their real-world locations, where and when they subscribed to your service as well as any number of custom fields manually added or imported from CRM. It also features excellent auto responder functionality, allowing you to streamline your sales process and make it easier for the sales team to close deals. Get Response is a good solution for small businesses that want robust email marketing tools without an elaborate setup or high price tag that many other services bring. Get Response is easy to set up and easy to use, which makes it perfect for many small-business users. AWeber is a premium email marketing service with a lot to offer. It’s one of the best solutions for businesses that rely on email marketing as a significant portion of their marketing mix. Although not perfect, AWeber comes standard with a host of useful tools, a wide range of features, and great support. If you’re in the market for professional email marketing services, AWeber is by far and away one of the top companies to check out. AWeber doesn’t offer any free options, but the service provides a great value with all of the features, benefits, and support they provide, especially for those who are heavy into email marketing. There are five listed plans on their website, starting at $19/month for up to 500 subscribers and up to $149/month for up to 25,000 subscribers. The company offers services for more than 25,000 subscribers, although you’ll have to contact them directly to get a quote based on your needs. Email tracking is one of the best elements of AWeber. The company provides extremely detailed metrics, allowing you to see which individuals have opened an email and what specific actions they’ve taken with that email. But AWeber goes even further than that – they also provide tracking once readers click a link and arrive on your website, and allow you to look at conversion metrics for which subscribers ultimately purchased something. They also provide a way to track independent subscriber lists, and an email can be sent to as many subscriber lists as you like at the same time. Unfortunately, AWeber’s autoresponder system is a little less well designed than their email tracking tools. The method for setting how many followup emails to send to each subscriber doesn’t work well because you’re unable to easily set the number of followup emails. By setting the number of emails for a user to receive, the system inadvertently fails to send a certain number of emails below the number you specified. The best way around this is to not set a number and just have all readers receive all followup emails, or set a high number so that they no longer receive any emails at all. It’s confusing, and is implemented somewhat poorly. But there’s no reason to get too hung up on this – AWeber’s tools for tracking specific users and the followup emails they’ve received works well and is extremely easy to use. AWeber provides a nice variety of different templates, and allows a good amount of customization for each of these templates too. On top of their forms and templates, they offer unlimited image hosting on their site too. The company also allows you to have as many forms as you like per subscriber list, which can be useful to test the results of different forms. AWeber offers stellar customer service with phone and email support during regular business hours. The company also offers an API interface for those who regularly work with subscriber databases or manipulate data. Finally, AWeber is kind enough to inform you of whether your email will be regarded as spam and if you’re utilizing any blacklisted links in your email, saving you from sending emails that will be sent right to the junk bin. InfusionSoft is an interesting software suite that combines a customer resource management system, a web marketing platform and eCommerce integration into one interoperable package. This makes it perfect for small and medium-sized businesses that want to integrate their sales data and marketing campaigns with their CRM system. 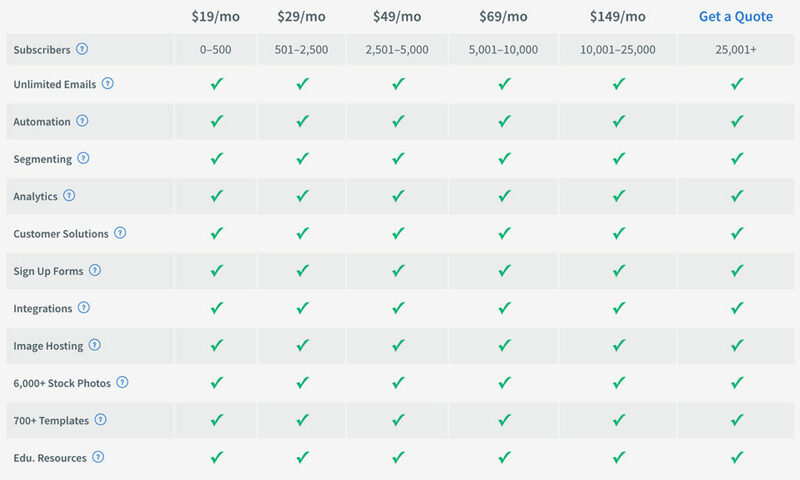 InfusionSoft comes in a number of different pricing options. The Essentials package consists of the CRM and the automated marketing suite and is a good choice for smaller businesses that rely on third parties to handle their actual sales transactions and don’t need sales automation. It is priced at $199 per month. The Deluxe Sales package adds sales automation to the features present in Essentials and is priced at $299 per month. It offers additional tools to streamline your sales team and maximize their effectiveness, making it useful for businesses that find their sales outgrowing their sales team. The Deluxe E-Commerce option is also priced at $299 per month, but instead of sales automation tools it adds eCommerce support that allows you to integrate your online sales with your CRM and marketing campaign data. Finally, the Complete edition combines the features found in both the Deluxe Sales and Deluxe eCommerce packages. This package costs $379 per month and is good for businesses that want to maximize the benefits of the integration between web marketing, sales automation and eCommerce that InfusionSoft offers. All four of the packages also require you to purchase a $1,999 one-off start-up package. This package includes direct hand-on training on the use of the software from InfusionSoft, as well as help in migrating data from your previous sales software solutions. While this raises startup costs, it does allow you to make effective use of InfusionSoft right from the start and get immediate results. The best features of InfusionSoft are its reliability, user experience and integration between the CRM, sales, marketing and eCommerce aspects of business. InfusionSoft loads up and performs tasks without long delays and does not suffer from crashes or compatibility issues that sometimes bother other CRMs. It also suffers very few sending failures with emails, which is very important when conducting email campaigns. From the initial start-up to phone and email support, InfusionSoft works like a partner to make sure there are no issues and that its clients are able to use their software to the fullest. This means problems are resolved quickly and new hires can be quickly brought up to speed on best practices. InfusionSoft integrates the four aspects of online sales together in its campaign builder. It is essentially a flowchart that allows you to decide what should be done with each customer at each point in the process. You can then track each of your clients as they progress along the campaign pipeline. This gives you a great degree of control and allows you to clearly visualize important data. InfusionSoft is a great marketing solution for businesses that want to integrate all aspects of the sales process into one software suite and leverage this integration into a more efficient sales process. The software and email marketing services offered by Constant Contact is intuitive, easy to use regardless of your skill level, and very effective. It can help to generate lots of new customers. Constant Contact makes it simple for you to set up an email campaign. All you have to do is create the look you want, select your target audience, schedule the launch of your program, and send the emails. It’s that simple. Before you know it you will be receiving many responses to and inquiries about the products and services you have to offer. The software helps you to create the look you want by giving you access to hundreds of templates while giving you the option to create your own. This helps to make the process of creating the perfect email campaign for announcing your sales and special events fast and easy. The templates are ideal for beginners while people with different levels of experience have the freedom to add unique touches they think will help to make their email campaign more effective. With the Constant Contact software you can make as few or as many changes as you want to the template. Creating email advertising campaigns using the Constant Contact software is fast and easy. You can start by working with a blank template, use the designer mode, or work directly with CSS and XHTML to customize the email campaign to suit your specific needs. You can even copy and paste your HTML source code directly into your emails in the template. This type of flexibility is part of the reason many people rave about the email marketing software offered by Constant Contact. It gives you as much or as little help as you want and need. The large variety of patterns, colors, and layouts, the freedom to move around the text blocks, and the ability to adjust the design features makes creating a unique bulk email marketing campaign easy. Plus you can add documents, images, and links to videos, polls, and surveys, and other features to your emails. You can even create and send out surveys to everyone on your email list. The email marketing software and services offered by Constant Contact is a welcome addition to the marketing program of any company whether large or small. You can import text and images directly into your WYSIWYG editor or create and edit your message using drag-and-drop functionality. You can also create reports listing the responses, forwards, bounces, and complaints. The social-share toolbar and the social media buttons for Facebook, LinkedIn, and Twitter can help increase your website visitors. The social stats tools show how many likes, shares, and tweets your emails receive. Constant Contact is a reliable solution but the features and benefits offered at their price point don’t seem to add up. MailChimp is one of the best known and most popular email marketing services. This is a service that can help you manage your emails, create autoresponders, create online newsletters and much more. MailChimp offers several different plans, including one that’s free. In this review, we’ll take a look at some of the main features and benefits of MailChimp to determine if it’s a good value. Large Selection of Templates -Email templates allow you to create customized, professional looking emails. This is especially helpful if you are sending out newsletters. You can choose the template that most closely matches the theme of your messages or newsletter. Automation -You can send your emails on a schedule that works best for you. This will vary depending on who you are targeting, what time zones they are in and other such factors. You will be able to track these factors, so you’ll know when people are opening your emails. This will allow you to send your messages on the best hours and days of the week for optimum results. Build Segmented Lists -You can get better results from email marketing by segmenting your lists. This means separating your lists into different categories based on customer profiles. Some of your products or messages may be more suitable for some of your subscribers than others. This allows you to target all of your emails. Subscriber Profiles -The key to effective email marketing is to know your audience as much as possible. MailChimp has tools that help you analyze your customer profiles. You will be able to track data such as your subscribers’ time zones, open rates, mail clients and what type of devices they use. This information is valuable in helping you create more effective campaigns and segmenting your lists for better targeting. Mobile App -With MailChimp’s mobile app, you’ll be able to access all major features from your smartphone. This allows you to manage your campaigns from any location. MailChimp has several plans that allow you to choose the level of service that you need. Entrepreneur -This is Mailchimp’s free plan, which allows you to have up to 2,000 subscribers and up to 12,000 emails per month. You can sign up for this plan without a credit card. Growing Business -With this plan, you are charged based on the number of subscribers you have. For example, for $10 per month, you can send unlimited emails to up to 500 subscribers. You can also purchase credits on a pay-as-you-go basis. High Volume -If you have a very large list, or multiple large lists, you can sign up for one of MailChimp’s high volume plans. For example, you can send up to 7,200,000 emails to 600,000 subscribers for $2,550 per month. The free plan is adequate for many small businesses and for anyone who is just starting their list. You can always upgrade as you get more subscribers and start sending a higher volume of emails. MailChimp is one of the most flexible email marketing services you can find. While many competitors offer free trials, MailChimp is the leading email service that has a free plan that you can use as long as you want. The way the plans are structured allows you to pay only for what you need. Email marketing is still one of the most effective ways to stay in touch with your audience and to build your influence. With MailChimp, you have access to a wide variety of useful features that help you get the most out of your email list. Sendy is a unique entry in the email marketing field as it is both self-hosted and very inexpensive. It is an excellent solution for a small business that needs to send out email updates for multiple products or brands. Because Sendy is a self-hosted service, it’s cost per email sent is incredibly low compared to other services, but that comes at a cost of almost no in-person or phone support for the software. Sendy has a one-time startup cost of $59 if you choose to set it up yourself, though you can have a professional assist you in setting it up for an additional $79. In addition to those costs, you must also have your own Apache and MySQL-compatible server to host Sendy on. Almost all modern hosting services support this, so in most cases if you have your own website you are all set. After the initial license fee, you pay Amazon Web Services per email sent, as it provides the actual email infrastructure for Sendy. The Amazon Simple Email Service pricing model is one of the biggest advantages of Sendy. Each email costs one hundredth of a cent, meaning that 1,000 emails will set you back $1. Sending 500,000 emails costs $50 – still less than most other email marketing services charge per month. This means that a business sending 10,000 emails per month would be saving between $100 and $200 compared to other marketing services. Because it is so inexpensive, Sendy makes a great marketing tool for a small business. The lack of subscription fees and the low per-email cost also make Sendy very scale-able for both low-volume and high-volume applications. Sendy is also very reliable. It uses Amazon’s Simple Mail Service infrastructure to send your emails, which Amazon has developed and optimized over decades of eCommerce experience. This means very few emails will fail to reach their destination. For those emails that experience difficulties along the way, Sendy has tools to automatically handle bounce, complaint and unsubscribe requests. This allows you to maintain high deliverability while also updating your customer information and keeping you from accidentally running afoul of anti-spam legislation. In addition to delivery, complaint and unsubscribe tracking, Sendy also provides excellent reporting tools and campaign management options. It produces colorful charts showing the percentage of recipients that opened the emails, deleted them, clicked links in them as well as a variety of other data such as where in the world they are located. This, together with Sendy’s custom fields functionality allows you to tailor your email campaigns to individual clients. Sendy has introduced a radical new option in the email campaign market. It is incredibly low-cost, highly scale-able and features a good suite of features. It is an incredibly powerful option for businesses that send many emails and want to manage their email system in-house. So to summarise this Email marketing software comparison exercise, I will reiterate what I stated at the start. There are literally dozens (if not hundreds) of different providers out there and this article only covers six email marketing services which would suit a small to medium business. By no means are all these solutions enterprise level. Sendy.co clearly offers the cheapest option for sending emails to your list. Get Response is my top recommendation for small businesses and start up bloggers who want to keep in touch with their list and promote their content. Infusionsoft is my favourite email marketing/CRM solution for small businesses, bloggers and eCommerce businesses who want to create advanced funnels to promote and sell products.